Sean Thorpe is a member of the Aristotle Capital research team and a veteran of the investment industry. Sean was an analyst and Portfolio Manager at Reed, Conner & Birdwell, LLC (RCB), with responsibility for co-managing the International strategy. (RCB combined its business with Aristotle Capital in January 2012.) Prior to his tenure with RCB, Sean served as Senior Vice President for Shamrock Holdings, LLC, where he specialized in activist investments. Sean was also Founder, Partner and Managing Director for Mandeville Partners, LLC, where he was focused on international mergers and acquisitions, with a focus on telecommunications throughout Latin America. 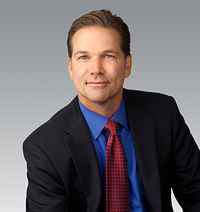 He has held positions as the Vice President in Strategic Planning at Salick Health Care, Inc. and as financial analyst for both Kidder Peabody & Co. and Drexel Burnham Lambert, Inc.
Sean earned his Bachelor of Arts degree in Economics and Finance from the University of California, Los Angeles. He is a founding parent of Valley Charter School, a charter school that opened in 2010 in Los Angeles, California.